Following are remarks shared by Ron Lezell at the funeral and shiva for our dear Sha’ar Zahav member and friend. I met Walter in1978 at a Friday night service of our fledgling synagogue at Dovre Hall, now the Women’s Building. He invited me to his 50th birthday party in December 1979 held at Sutter’s Mill in the Financial District. The large crowd sang to him “…..hey Lottie, Lottie, Lottie, hey Lottie, Lottie Lo…..”. Walter was affectionately known as Lottie which was his earlier drag name. I felt like a big shot as a 26-year old – with this older, open gay man who ran his own successful business, the National Collection Agency. Around him were other old men and women (they must have been in their 40’s or 50’s) – his friends and leaders of the “gay liberation” and lesbian movements in San Francisco. I …. and we, were about to symbolically climb on to Walter’s shoulders. Walter provided the foundation, the support, for other Jewish gays and lesbians to lead our community – the likes of Harvey Milk, Carol Migden, Roberta Achtenberg, Mark Leno, Scott Weiner, Rafael Mandleman – each of whom became connected to a synagogue, Congregation Sha’ar Zahav (Congregation of the Golden Gate) that Walter helped to build and sustain. Over the past 40 years, Sha’ar Zahav became a vessel through which Walter could tap into his love for Judaism and embrace his Jewish n’shama, his soul. You could look into his eyes as tears quickly materialized as he remembered his parents, Fannie and Jacob, and his three older siblings from his Brownsville neighborhood of Brooklyn. Tears were routine as Walter read the words to put on his tallit, as he recited the Shema and of course the blessings before and after the reading of the Torah, having the high honor of the first aliyah on Yom Kippur for the past four decades. He loved it when so many of you would greet him at Rosh Hashana and Yom Kippur services. For many years, Walter attended the congregational Seder and brought bottles of Slivovitz, a 100-proof plumb brandy to share, a Leiss family Pesach tradition. 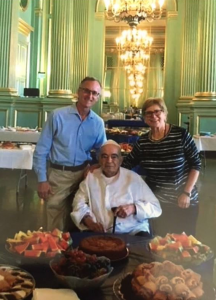 One of my favorite times with Walter was following the Yom Kippur breakfast in 2014 at the Scottish Rites Temple. Walter was a big Giants fan and with the playoff game in extra innings, Walter was happy to stay with the group of families and children in the lounge to watch the game’s conclusion. Sitting in a large, comfortable chair, surrounded by his Jewish community that he helped to sustain, the game went on, and on, finally ending with an 18-inning Giants victory to which he joined in celebration. The great Jewish 12th century rabbi, physician, philosopher, Maimonides, was known for describing a Ladder of Tzedakah (charity) – the highest level of giving is to give willingly, never seek recognition, not knowing the recipient and help the recipient to become self-sufficient. Walter lived on the highest rung of Maimonides’ ladder. In 1984, Walter donated his 1969 Silver Shadow Rolls Royce (with a “Hi Lot” license plate) to be raffled as part of the Sha’ar Zahav campaign to purchase our Danvers Street home. Selling almost all the 1,500 tickets, we raised over $75K, almost 1/3 of the $240K purchase price, enabling Sha’ar Zahav to buy Danvers Street – our first “Home of Our Own”. 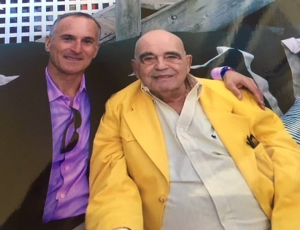 Walter donated his grand piano to Sha’ar Zahav, which was moved from his home in Monte Rio after it had been in the Liberty Street home of Violet, Walter’s elegant sister, member of Sha’ar Zahav and mother of Fred. A few days after Yom Kippur, Cantor Bernstein, Arthur Slepian and I visited Walter in his new apartment in Lafayette. We brought with us our Torah, a mezuzah and a kugel baked by Judith Wolfe. Walter always commented on how much he loved her kugel, which she baked to supplement the huge Rosh Hashana and Yom Kippur break fasts that Walter has endowed. We were with Walter for an hour and a half sitting around him, bringing the table in front to hold the Torah, wine, challah and salt. Cantor Sharon rolled the Torah to the Shema and Ve’ahavta. With Walter wearing a kipah and tallit, he chanted, softly and with a bit of our support, the blessings before and after Sharon’s chanting Torah. Walter cried tears (seemingly of joy and memory) as Sharon chanted Kol Nidre. We continued with several Hebrew songs including the Four Questions and even Somewhere Over the Rainbow. Seeing Walter’s fingers moving to the music and his soft smiles, was very moving. We also chanted blessings and Shehecheyanu as we hung the mezuzah. A full hour into our visit, during one of our quiet moments, out of the blue Walter said, “when is the kugel coming”? He savored the warmed kugel finishing the small wine glass along with it.